Just for a quick recap, we have been working on adding ALL of the Sherwin-Williams paint colors to the Rugh Design Color Wheel. So as the process continues, I wanted to highlight a color per week that stands out. Recently we have highlighted Amazing Gray (a go-to light gray) and Alabaster (perfect slight off-white). Follow this link to see all of our Color Wheel Update posts. This week, I am highlighting Light French Gray SW 0055, a muted gray color with a slight blue undertone. Honestly, it reminds me of my own wall color, Lattice. That’s probably why I was attracted to Light French Gray in the first place! Not to mention, it has been coming up lately in my Color Consultations as an option for an overall neutral paint color. I would classify Light French Gray as a cool gray that definitely has a blue undertone that can come out stronger in certain lights. So, be sure to test it out first if you want to err on the side of gray for your wall color. If you do want a color that has a blue undertone, but is more of a subdued gray, then Light French Gray could be just the right color! 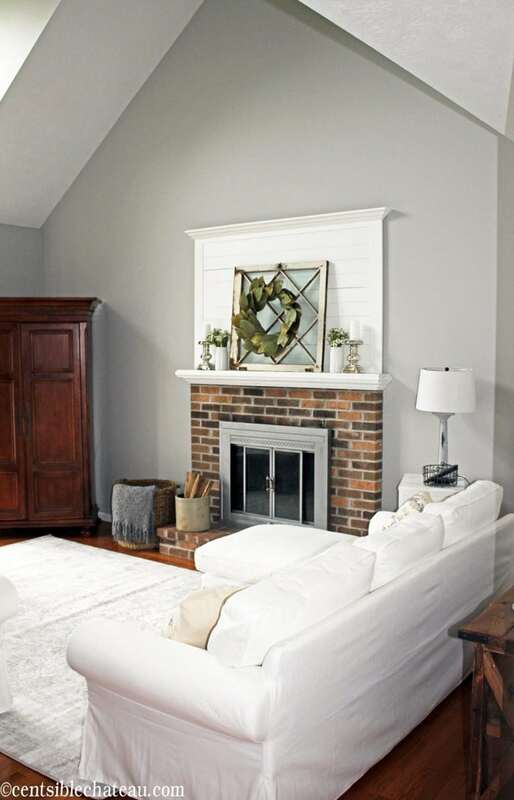 Since it is a cooler color Light French Gray will help to open up your smaller spaces. That is one of the main reasons that I picked a similar color for my home! If Light French Gray sounds intriguing and you want see what other colors and schemes could coordinate with it then check out the color schemes I believe will coordinate nicely with it. 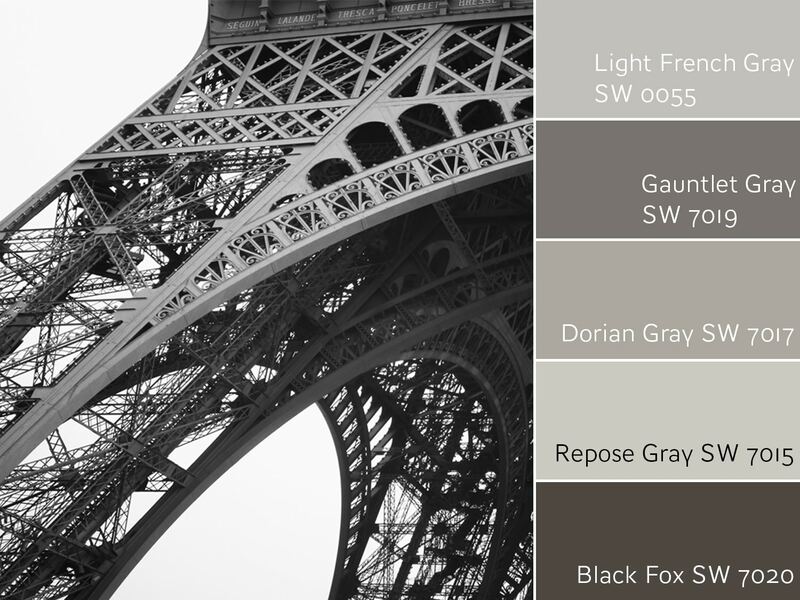 I scoured the net and put together a Pinterest gallery of Light French Gray. See it below and let me know which you like the most. If you have your own pictures send them to me and I will post them! I love the thought of using Light French Gray as a main wall color in an open layout for a living room, dining room and kitchen. 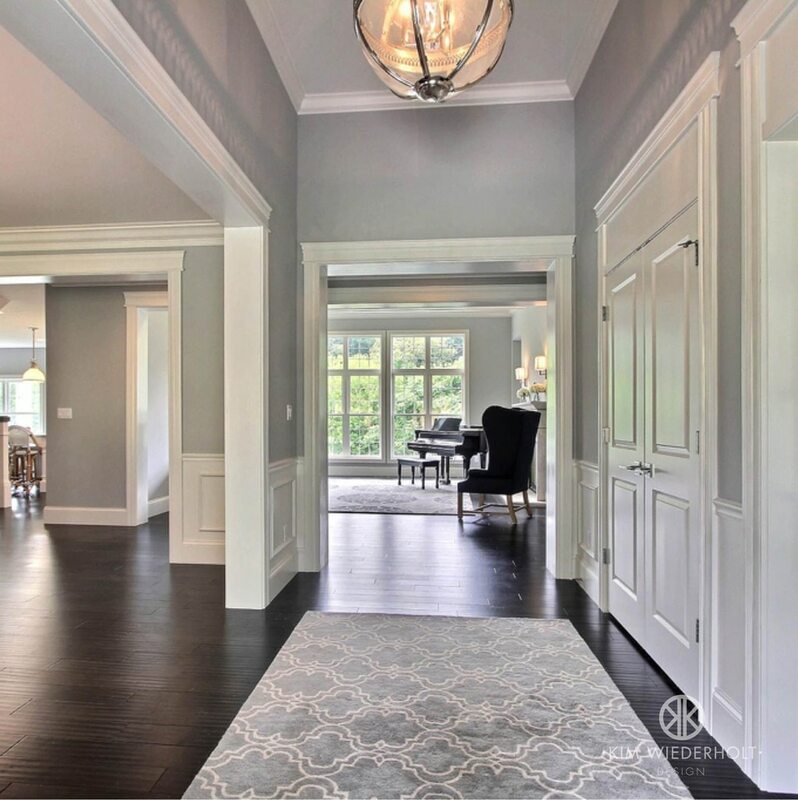 LFG looks especially gorgeous next to crisp white trim and/or white furniture. On the opposite end of the spectrum, it also pops against dark cabinets or espresso hardwood floors. Light French Gray also shines in master bedrooms and bathrooms to create a soothing and relaxing environment. Using LFG to produce a neutral and more monochromatic scheme looks classic, sophisticated and timeless. At the same time, Light French Gray can be a backdrop for contrasting or complimenting colors that are brighter and more saturated. My favorite look and design aesthetic for Light French Gray, includes using white trim, darker wood furniture, charcoal gray fabric on upholstery and pops of aqua for some color. The diversity of texture, color and contrasting hues makes this a winning combo in my book! Well, it wouldn’t be fair to only feature Light French Gray for interiors, because it works beautifully for exteriors too. I love the look of the painted shingles in LFG with white trim and black accents for the shutters and front door in the picture below. Light French Gray could also work well for a trim color with a darker main body color or a white/off-white color for a softer look. 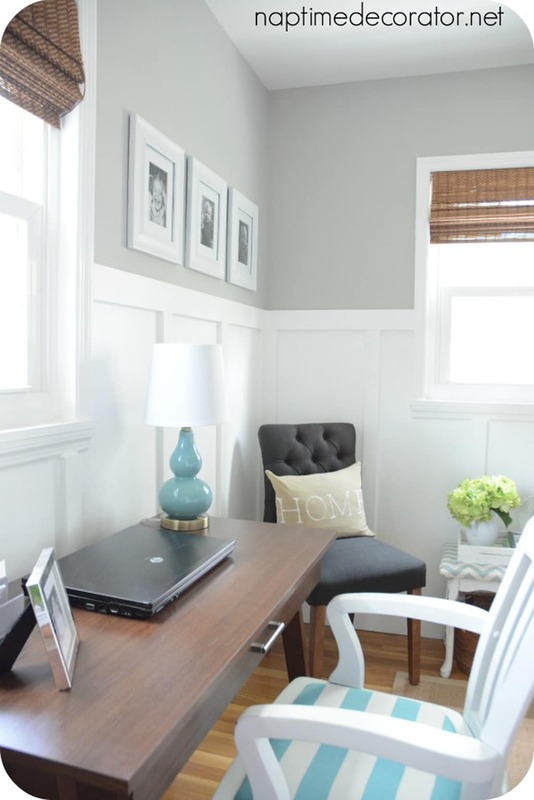 In conclusion, Light French Gray is a top choice if you are seeking a cooler color to open up your space or want a soft gray that gives a perfect neutral backdrop for endless design possibilities for your home. If you are considering Light French Gray, the best way to find out if it is right for your space, is to grab a sample and test it out. If you are still having trouble deciding, contact me for a Color Consult to nail down the best color for your interior or exterior. I have a passion for color and love being able to help clients find the right color to make their home beautiful! Light French Gray had the spotlight, but I also wanted to highlight a color from the Color Wheel update, Coral Bells. 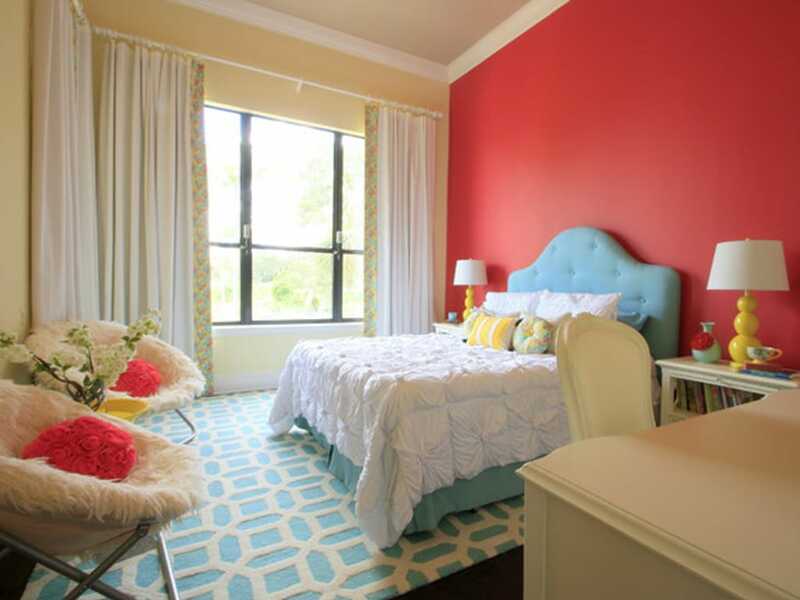 This is a fun and bright coral color that is perfect in a girl’s bedroom as an accent wall color or even as a ceiling color for something unexpected! I also really like the idea of using Coral Bells in a powder bathroom to add some flair to a home. We are currently building a new construction home. I wish I would have come across your design details/information. I painted my kitchen cabinets and desk area Light French Gray/Sherwin Williams. I LOVED the small swatch and knew better than to not sample a board. But because I had researched the perfect gray for several months, I fell spot on by comparing just the swatches. Now I know! UGH! Always try a sample regardless. Now my head if doubting the color every time I visit the site. Our countertops are on and backsplash. The cabinets look lilac. I can’t quit convincing me that is what I’m seeing, light purple vs. light gray. I don’t want to repaint for obvious reasons. Is there lighting (bulbs) that your can recommend using to tone in on simply the light gray zone and diminish the light purple zone? Thanks for your help! This is an affiliate of mine, but I stand by the product as being a solution to your design dilemma! Keep me posted on everything. Hello!!! I am currently finishing up a kitchen remodel and I chose the wrong color for my walls. Wayyy too light! I’m thinking of trying light French gray I have crisp white cabinets and Formica Calcutta marble countertops and island. I would love to send you a couple pictures. Hi I am considering light French gray in my living room. I have a very open high ceiling living room. I know it looks awesome next to white. My concern is I have lighter brown trim around all my windows and hardwood floor. My furniture is black. Do u think it will look good in my house? Do you know the what trim color they used on the exterior photo of the french light gray? Also the color for the door and garage? I don’t know what colors they are, but you can follow the link to the site to see if it is mentioned there. Thanks so much for reaching out! Hey there I’m in the process of having our new construction home painted and I chose a grey tile floor Antalya Gray HP flooring well I chose repose Gray paint and now I’m wondering if I made the right choice it hasn’t been painted yet so I came across your sight one of the samples I had was the light French gray but at first had that bluish violet Hugh but now I’m second guessing the repose Gray, the back master is south east on the backside of my master with two large windows above where free standing tub will be with 12ft ceilings but there is a breezeway attached off the back of the house so it gets natural light but not a whole lot at times, anyways any advice would be great thank you! Great question! Repose Gray does tend to have a slight bluish undertone, but it also looks more gray in other lighting. While Light French Gray is similar to Repose Gray, I have talked with a past client about LFG turning more lavender. I have not had a complaint about Repose Gray turning lavender. Really the best way to find out is to paint up a sample board and see how it looks in your lighting and next to your selections (flooring, tile, etc.). If Repose Gray turns out to have more of a blue undertone than you would like, there are several other soft warm grays that don’t have the blue undertone that you can try! Let me know how it turns out after you sample and if I can help you nail down the right color for your space! We were going between colonnade and light French gray. Our floors are lighter. We chose light French but now I’m worried about the blue showing up. Our house is transitional modern. What to do? Thanks for reaching out! Light French Gray can get a slight blue-lavender undertone, but it shows up in different lighting in different ways. I have seen Light French Gray look lovely in certain spaces, so it really depends. If it isn’t too late, test out a sample and see how it looks in your space. Agreeable Gray is my go-to warm greige that is also very similar to Colonnade Gray if you need a back up choice! Let me know how it goes and what you end up deciding on.